The Westside Subway Extension team is holding another round of public meetings beginning tonight to update the community on the draft environmental impact report being prepared for the line. Tonight’s meeting begins at 6 p.m. at the Los Angeles County Museum of Art; click here for the schedule for all the meetings. The subway planning team also has some new ridership projections available. Ridership is important because it’s one of the many criteria that the federal government uses to determine if the subway will receive New Starts money — those are funds provided by the Federal Transit Administration to build large transit projects. 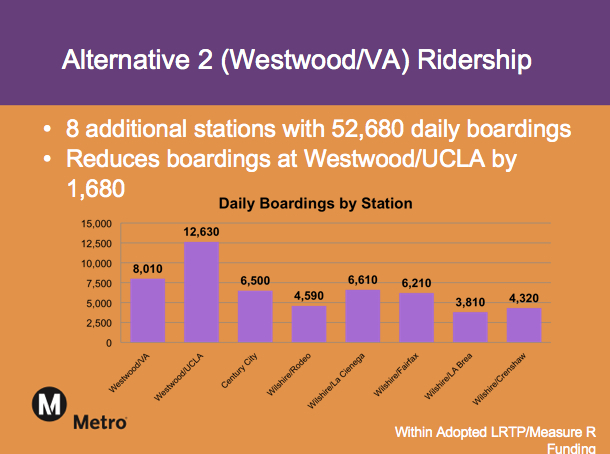 The slide above shows the number of daily boardings projected at stations along the line if the line is built all the way to the VA in Westwood (more on that in a moment), one of the alternatives being modeled. The key word in the previous sentence is projections — predicting the future is not an exact science — but it’s interesting and not entirely surprising to see that Westwood, home to UCLA, performs so well in the modeling data. Something else to chew on: the data suggests there’s a big benefit to getting the Subway Extension west of the 405 freeway. The 405 is kind of like a big north-south wall that spans the Westside and there aren’t that many ways to get past it — the reason that that traffic tends to get bottled up anywhere near the freeway. The slide at right looks at the boardings per mile on the Westside Extension compared to the other rail lines operated by Metro. 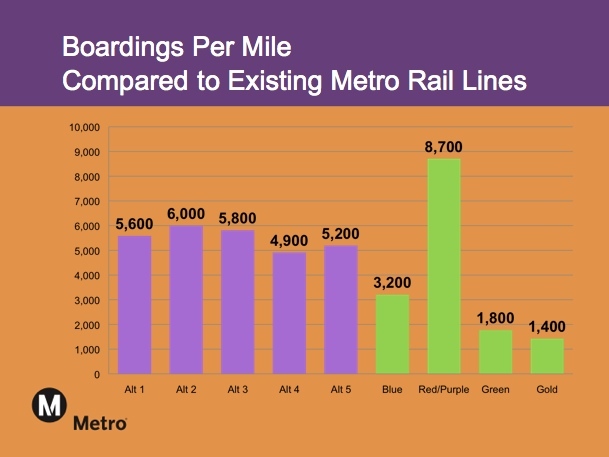 According to these projections, the only line that attracts more riders is the existing subway. •The draft environmental document is scheduled to be completed this summer, when the public will have a chance to comment on the report. •In the fall, Metro staff will likely make a recommendation on the line’s route to the Los Angeles County Metropolitan Transportation Authority Board of Directors. It will be up to the Board of Directors to choose a route and then decide to launch work on the final environmental document for the Extension. •As for the route, a few basic things are known and some still must be decided. The long-range plan adopted by the Metro Board of Directors last fall dedicated Measure R funding to a subway alignment that basically follows Wilshire Boulevard west to Westwood, including a swing south to Century City. The long-range plan did not provide funding for the line beyond Westwood to Santa Monica or for a segment that would run from Hollywood through West Hollywood to connect to the Wilshire line Beverly Hills. But those segments are being included in the draft environmental document because they could be built in the future if funds are found to construct them. •So what still must be decided about the route? Among the major decisions are whether or not to build a station at Wilshire and Crenshaw Boulevard, where a station should be located in Century City (there is significant public support for putting the station on Constellation in the heart of Century City rather than on the edge on Santa Monica Boulevard; a Constellation station also attracts more riders) and whether this part of the line should terminate near Wilshire and Westwood Boulevard or be extended past the 405 to the VA Hospital. I’ll post a link to the entire Power Point presentation for this round of meetings as soon as it’s available.